The world's third-largest island nation has a wide range of wildlife – there are over 450 species of mammals, 300 species of lizards, 110,000 species of insects, not to mention 800 species of birds. 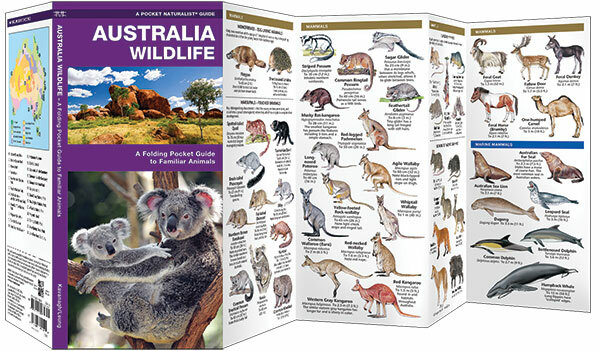 Australian Wildlife is the ideal pocket-sized reference guide for wildlife lovers of all skill levels. 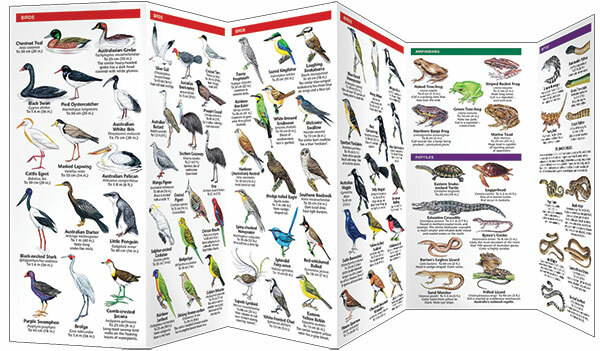 This beautifully illustrated guide highlights over 140 familiar and unique species. A map of the prominent vegetation zones found in Australia has also been included. Laminated for durability, this lightweight, pocket-sized folding guide is an excellent source of portable information and ideal for field use by visitors and residents alike. Made in the USA. The world’s third-largest island nation has a wide range of wildlife – there are over 450 species of mammals, 300 species of lizards, 110,000 species of insects, not to mention 800 species of birds. Australian Wildlife is the ideal pocket-sized reference guide for wildlife lovers of all skill levels. This beautifully illustrated guide highlights over 140 familiar and unique species. A map of the prominent vegetation zones found in Australia has also been included. Laminated for durability, this lightweight, pocket-sized folding guide is an excellent source of portable information and ideal for field use by visitors and residents alike. Made in the USA.